Marta Matyszczak was born in Chorzów, Silesia, south of Poland. She’s a writer, scriptwriter and journalist. She’s passioned about crime literature and she’s an editor of Criminal Cafe (Kawiarenka Kryminalna – www.kawiarenkakryminalna.pl) – one of the most popular Polish sites devoted to crime fiction. She’s taken part in writing courses during International Crime Festival in Wrocław and during Conrad Festival in Cracow. 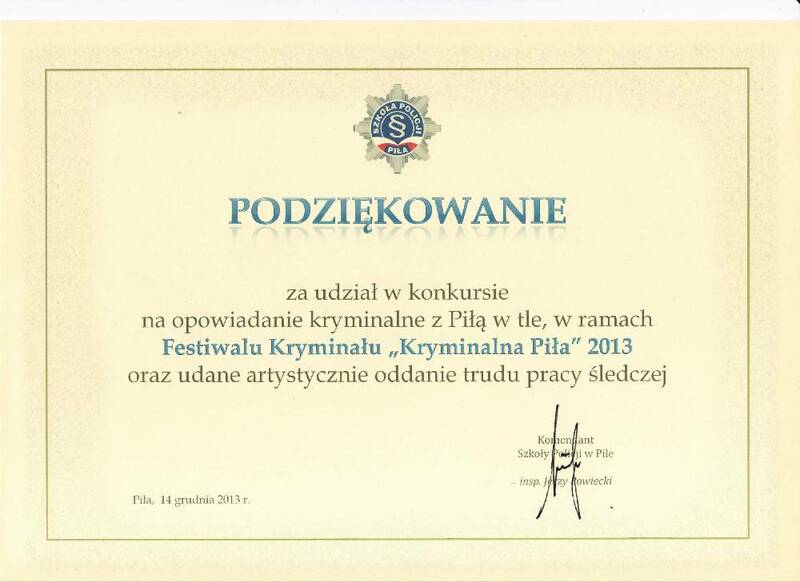 She was awarded for her crime short stories on International Crime Festival in Wrocław and Crime Festival in Piła. 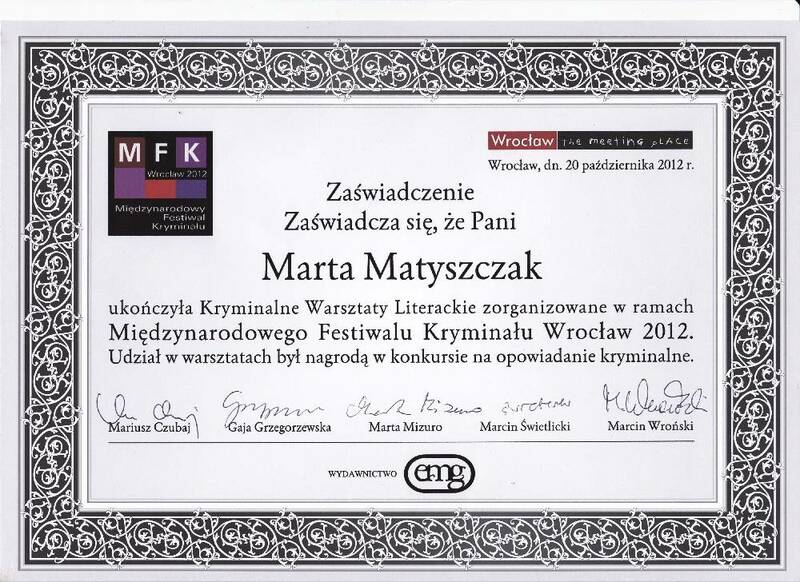 She finished scriptwritting course in Warsaw Film School. She’s an author of crime farces for theater. She loves dogs and travelling, specially in the footsteps of characters from crime stories. 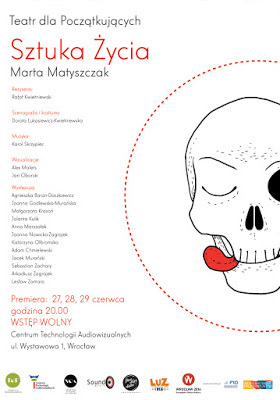 „The Mysterious Death of Marianna Biel” is her first book, which begins „The Doggy Crime” – a series of humorous crime novels with detective Szymon Solański and dog named Gucio as protagonists. Gucio is a little dog. Marta brought this beauttiful mongrel home from shelter in Chorzów and based Gucio’s character from „The Mysterious Death of Marianna Biel” on him. Gucio likes to sleep a lot, eat a lot and sometimes go for a walk. Marta Matyszczak was born in Chorzów, Silesia, south of Poland. She has graduated in Political Science with the specialization of Journalism at the University of Silesia in Katowice. 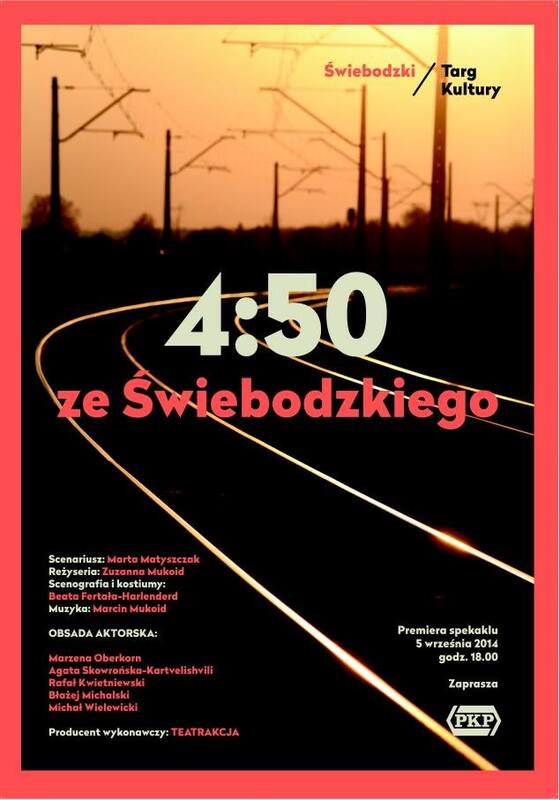 She writes a column for „Chorzów. City of Culture”. Books are Marta’s passion. 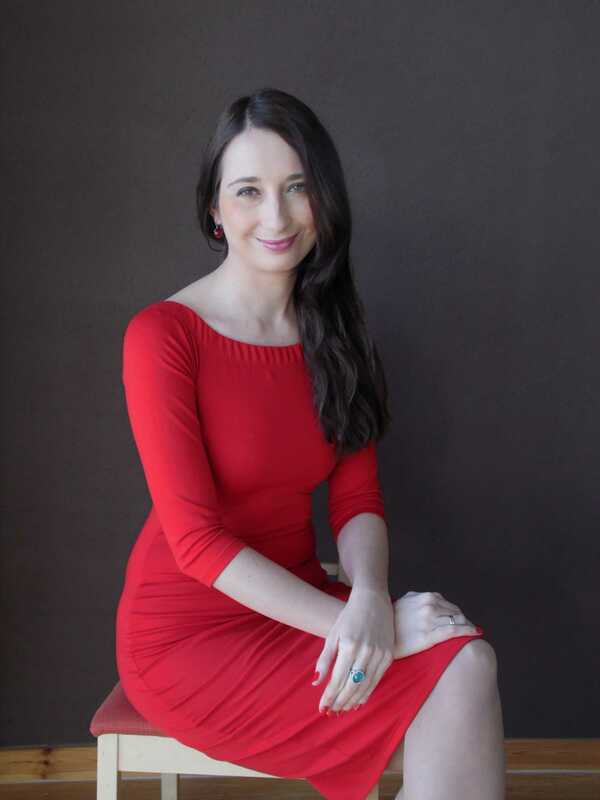 She writes crime novels and runs Criminal Cafe (www.kawiarenkakryminalna.pl) – one of the most popular Polish sites devoted to crime fiction. She writes books reviews, interviews there. She also organizes authors meetings and lectures about crime fiction in libraries, book fairs etc. She’s always wanted to write. But it took a while before she saw her first book in the bookstore. She’s lived in Galway, beautiful Irish town on the west cost of Ireland for few years. She worked there in casino, she was a waitres (very bad one), shopkeeper in butcher and she works in fast food restaurant as well (as a result of which she’s become a vegetarian). Now she uses all these experiences in her writing. She knew that she will be crime writer since she’s read all Agatha Christie’s books which she’d found in library in Chorzów. She couldn’t sleep because she was so scared of them. After that she couldn’t sleep again but this time this was because of Joanna Chmielewska’s humorous crime stories. Now she wasn’t scared, she was dieing with laughter. So she established ones for all that she will be writing humorous crime novels. She took part in writing courses during International Crime Festival in Wrocław (four times!) 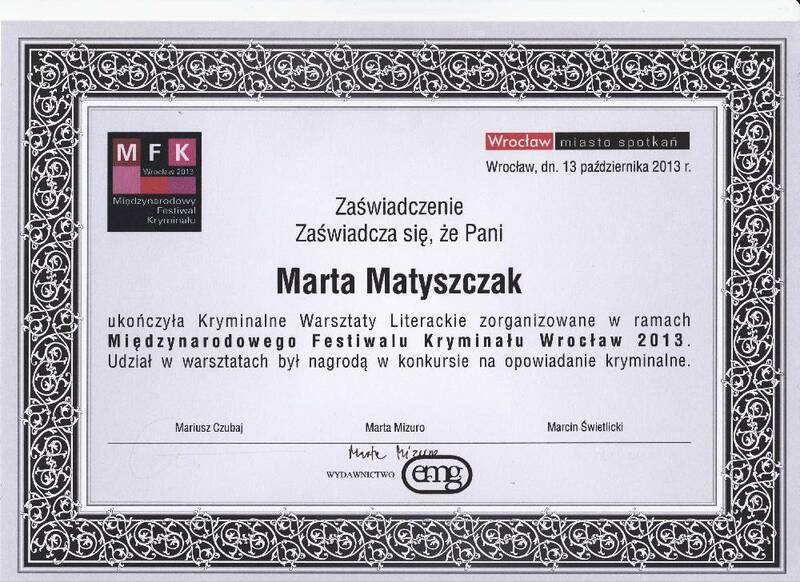 where the best Polish crime writers tought her some crime craft. 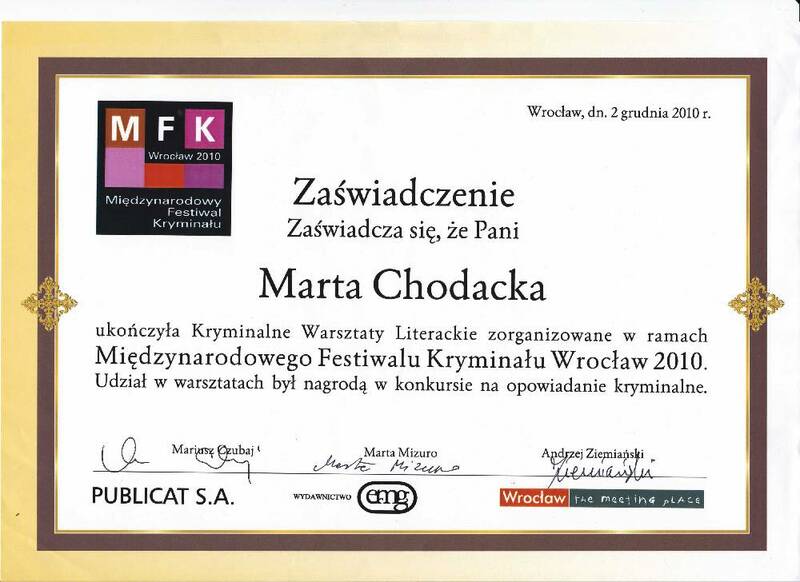 One of her short stories („That’s it for now”) was awarded on Crime Festival in Piła and was published in an anthology of short stories „Malpractice”. She also took part in writing course during Conrad Festival in Cracow which was run by Marek Krajewski, one of the best Polish crime writers. 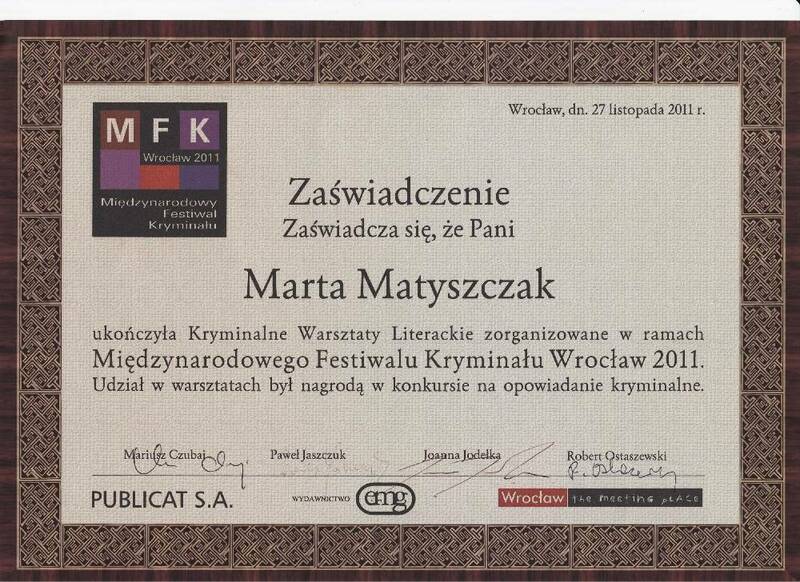 She finished scriptwritting course in Warsaw Film School. In general people like dogs (that’s Marta’s case) or cats. She’s always had dogs since she was a little girl. 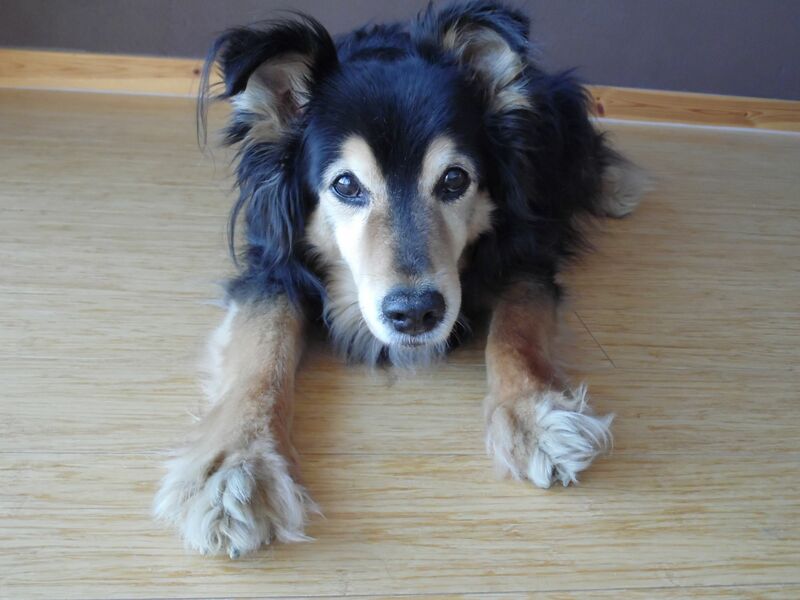 She went to shelter in Chorzów in 2006 and she brought Gucio home. After years she based Gucio’s character from „The Mysterious Death of Marianna Biel” on her real doggy. When she doesn’t write, she reads. A lot. She loves Kate Atkinson’s and Ian Rankin’s books. She also likes novels of Johan Theorin, Arnaldur Indriðason, Peter May, Bernard Minier, Ann Cleeves, Jo Nesbø, Donny Tartt, Robert Galbraith (or J.K. Rowling). She admires Eduardo Mendoza’s and Evžen Boček’s sense of humor. She reads tones of Polish crime novel’s as well. She’s written few criminal farces for theater. She loves travelling. And she loves books (as you probably already figured it out). So she travels in the footsteps of characters from crime novels. When she goes on a trip, instead of usual travel quide, she takes with her a book which is set in the place she’s going to visit. And then she can check out where for example Kurt Wallander used to work, drink his coffee or where the morderer has left the body. Welcome to my literary world. It will be criminally and humorous. I hope you will enjoy it.